Kaitlyn Young makes her Invicta FC comeback this Friday, and she can thank Sarah Patterson for stepping in to save it. The recently un-retired fighter and former Invicta matchmaker was supposed to fight Zarah Fairn Dos Santos at Invicta FC 32, but Patterson has stepped in to face Young on less than one week’s notice after Dos Santos was forced to withdraw from the card due to visa issues, the promotion announced Monday. Originally scheduled for featherweight, the bout will now be a 150-pound catchweight affair to accommodate Patterson. This will be Young’s first appearance for the promotion since Nov. 1, 2014, when she lost to Raquel Pa’aluhi via unanimous decision. It was the fourth consecutive loss for Young, who then proceeded to take a break from the sport and later worked behind the scenes for Invicta starting in April 2016. She came out of retirement this past August, defeating Reina Miura via unanimous decision at a Rizin Fighting Federation show in Nagoya, Japan. Young holds notable wins over Miesha Tate and Julie Kedzie. Her pro record sits at 8-9-1. 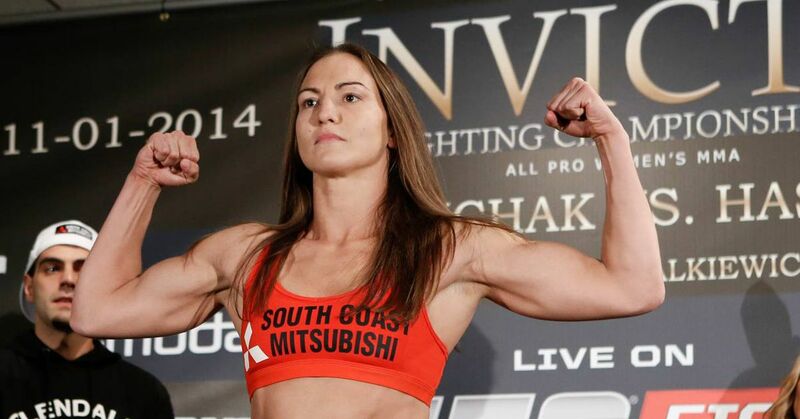 Making her Invicta FC debut, Patterson has been sporadically competing in MMA since 2002. “Primal” holds 5-4 record and is coming off back-to-back losses. This will be her first fight since December of last year. Invicta FC 32 takes place Friday at Firelake Arena in Shawnee, Okla. In the main event, Pam Sorenson battles Felicia Spencer for a vacant 145-pound title.